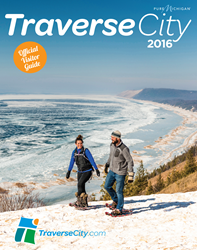 Traverse City Tourism has just released the 2016 edition of "Traverse City'" its magazine and visitor travel guide. The publication features 107 pages of articles, colorful photos and useful information designed to bring this picturesque Lake Michigan vacation region to the attention of a wider national audience. Traverse City Tourism announced this week that it has released the 2016 edition of "Traverse City", its magazine and visitor travel guide. Traverse City has long been treasured by Michigan residents for its scenery, colorful history, imaginative cuisine and laid-back friendliness, as well as the low humidity, warm sunshine and cool coastal breezes that make its summers so comfortable. This year, People Magazine named it one of “America’s Foodiest Cities,” Country Living listed it among the 20 Most Charming Beach Towns in America, and Smithsonian.com included it on its list of 20 Best Small Towns to Visit. More of a coffee-table magazine than a tourist guide, "Traverse City" avoids promotional clutter in favor of clean layouts, large color photos and informative articles. There’s also a great deal of practical information to help visitors plan their vacations, including detailed schedules of activities and events, a helpful lodging section, a guide to some of the region’s best restaurants and a section called Traverse City Seasons with suggestions for enjoying the area’s best year-round attractions and activities. Organized in 1981 as the Traverse City Area Convention and Visitors Bureau, Traverse City Tourism is a nonprofit corporation that serves as the area’s official destination marketing organization. Its focused mission is to stimulate economic growth by attracting convention business and developing leisure tourism.